Fear. We're all familiar with it, the sense of impending harm, that feeling of "There's something bloody awful behind this door I'm about to open." The unsettling atmosphere instills f ear. Humans fear darkness, killing appendages like claws, fangs, tendrils and the like. The bodies of dead beings or anything that instinctively signifies one thing-DEATH. We avoid the enevitable event as much as we can early on in our lives. If we met anything that looks like it just lept out of a horror movie we'd run like theres no tomorrow, because it will most likely want to kill and kill means death. Of course there is also the fear of what comes after death, undeath? hence the idea of creatures from beyond the grave, Zombies, Vampires, Whights ect. 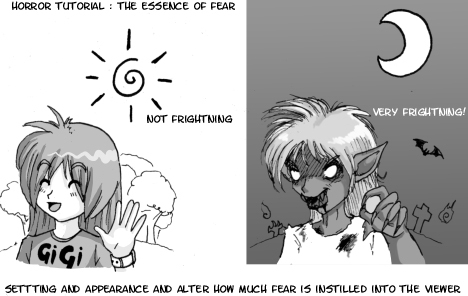 This tutorial will guide you into the essence of fear and how to implement it into your art. It is becoming more commonplace to have creatures that aren't mythologically/Science fictionally based but more like hideous mutations of earthly creatures things with horrific deformations , extra appendages and all sorts of stuff, slime corrosive acid and also the idea of corruption, something peaceful and benevolent being twisted into a creature of darkness, you know the drill. But first let's look at the basics of horror. Here's another one expect now using a being that appears to have a beast-like visage using features from animals and distorting them.